Siran Deraniyagala says that it is unlikely that Anuradhapura started as a simple village. It was a ‘Sophisticated imposition’ on the landscape. Excavations showed that Anuradhapura was at least 10 hectares in extent, by 900 BC, probably much more. This was a considerable size for an early Iron Age settlement. By 700-500 BC the settlement was at least 50 hectares and could be called a town. This spectacular increase in size suggests that Anuradhapura was the ‘main’ settlement of the island at the time. By 200 BC, Anuradhapura was nearly 100 hectares in extent. It was the tenth largest city in India and Sri Lanka. It was the largest city South of Ujjain. Arikemadu in Tamilnadu was a fraction of its size. Anuradhapura was well situated. It was equidistant from the seaports to its East and West. It was within reach of the mineral rich zones of the hinterland and also of Seruwila which had copper and iron deposits. It was surrounded by irrigable and fertile reddish brown earth which could be worked by iron tools. It had deep forests right up to the coast making it defensible against invaders. There was an advanced civilization in Anuradhapura by 900 BC. High quality pottery, iron tools and copper artifacts have emerged during excavation. Findings indicate that there was cultivation of rice and the breeding of cattle and horses. In 100-300 centuries AD, they were using large, uniform burnt bricks for construction instead of mud, wattle and daub. A piece of pottery dated to 600-500 BC with ‘Anuradha’ written on it indicates that Anuradhapura had writing 200 years before India. Anuradhapura became the capital of Sri Lanka during the time of Dutugemunu (161-137 BC). It was the first capital of the Sinhala Sovereign State. 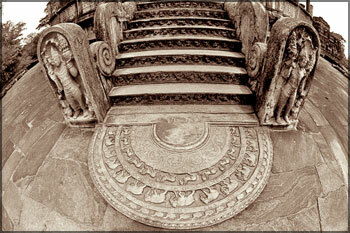 It continued as the capital up to the reign of Mahinda V (982-1017 AD). This means that Anuradhapura was the capital of the Sinhala king for an unbroken period of about 1,200 years. I think that this makes Anuradhapura the longest serving centre of political power in South and Southeast Asia. Maybe in the entire world. Anuradhapura was the political and administrative centre of the Sinhala State. It was also a centre for foreign trade. Excavations in Anuradhapura have unearthed foreign coins, Mediterranean ceramics and Sassanian glazed ware. Jetavana excavations unearthed over 500,000 beads of 300 different types. There was a direct route to the main port of the island, Mantota, located near the mouth of Malvatu Oya. Anuradhapura blossomed after it became the seat of the Sinhala king. Royal buildings came up. The ground plan of a palace near Abhaya Vava can be seen today. The royal pleasure garden, Ranmasu uyana, had summer houses, pavilions and baths. One bathing place had stone couches and water jets. 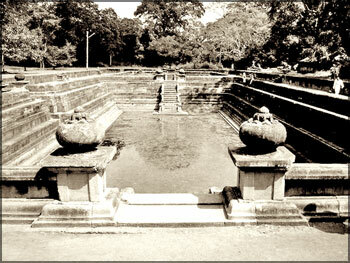 Anuradhapura went on to become a cosmopolitan city. Foreign merchants and emissaries from foreign countries were housed in a separate residential quarter. Kuttam Pokuna in Anuradhapura - considered one of the significant achievements in the field of hydrological engineering and architectural creations. Anuradhapura was a well planned city. Roads were constructed on a grid pattern. There was a good supply of water. The entire city was served by subterranean channels connected to reservoirs. There were scavengers and sanitary assistants (‘nagara guttikas’). There were facilities such as hospitals. There were elite residential areas as well as working class suburbs. The outer city and suburbs had markets, fairs and bazaars. Anuradhapura was the main centre of Buddhist worship in Sri Lanka. The Tooth relic and the alms bowl used by the Buddha were at Anuradhapura. The king was considered the protector of Buddhism and Buddhism was considered a protection for the king. Therefore these two sacred items were housed in a temple adjoining the royal palace. Anuradhapura contained Stupas such as Abhayagiri, Jetavana, Mirisavati and Ruvanvelisaya. These housed relics of the Buddha. Mahavamsa makes special mention of these Stupas. They were of colossal proportions. Jetavana had a diameter of 367 feet at its base and in its ruined condition stood at a height of 232 feet. Thuparama was originally in the shape of a heap of paddy. The Sri Maha Bodhi was brought and planted in the Mahamegahvanna garden. The leading monasteries, Mahavihara, Abhayagiri and Jetavana were in Anuradhapura. They were internationally recognised seats of Buddhist scholarship. These monasteries also had the distinction of preserving the Upsampada tradition brought from India. Anuradhapura was an important place of pilgrimage not only for the local Buddhists, but for all Theravada Buddhists in South and Southeast Asia. (The writings of S. Deraniygala, L. Dewaraja, R. A. L. H. Gunawardana, C. W. Nicholas and W. I. Siriweera were used for this essay).